This week and last week’s theme was ‘farm’. I’m not strict on teaching the little ones at all. It’s all through story time, games, and songs. 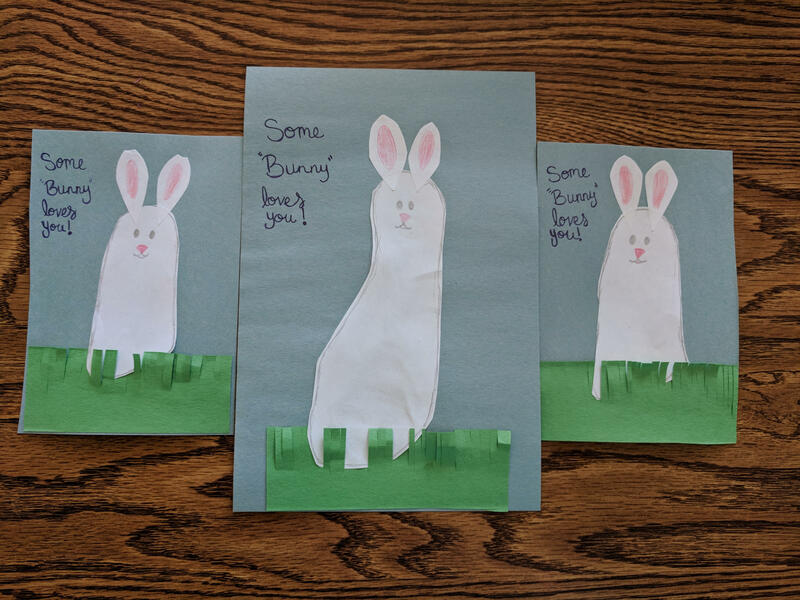 With Easter being this weekend, we did a craft today that goes along the Easter/Spring/Farm theme. Just a very simple and cute footprint bunny. We’ve done footprints recently with paint, so I just used paper and pencils. First, I traced the outline of everyone’s foot with a pencil on a piece of white paper and cut it out. I cut strips of green paper long way, the width of blue paper I used as a background, and then made little cuts in it to look like grass. I used a glue stick and glued it to the bottom of the blue page. Then, I put the footprint upside down on the blue paper, weaved the toe part into the grass a little, and glued it in place. Cut and glued on some ears and used color pencils to make a face. 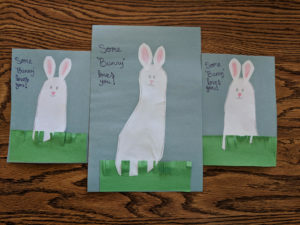 I wrote “Some ‘Bunny’ loves you!” for added cuteness. That’s it! The babies are to little to help, but my 3 year old was able to help with the gluing and telling me what comes next. I need to get some toddler practice scissors still, so she can help with that part later. 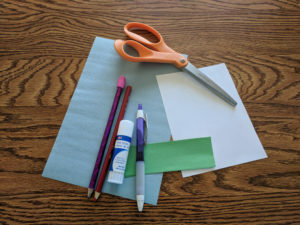 I’m so excited for our next craft!